I monitor the warbler populations on my patch, which comprises 152 hectares in Roby Mill, South Lancashire. 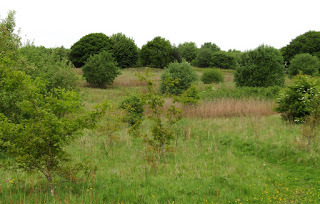 Much of the patch (rough grassland 16%, open scrub 27%, closed scrub 16%) is derelict farmland in various stages of succession – good habitat for several warbler species. This year I’ve made a concerted effort to verify the accuracy of my warbler counts. These are my preliminary results – 'preliminary' as the season is still very much in full swing. Method. This year I’ve been more systematic about things. Rather than merely counting them, I’ve been mapping singing males. I’ve been doing this to hopefully increase the accuracy of the results and, in particular, to rule out the possibility that I’ve been over-counting. 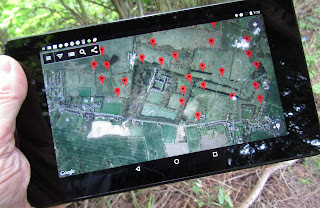 My monitoring technique is as follows: record, on a map of the patch (using a tablet app with GPS), the locations where I’ve heard song – at locations which are far enough apart for it to be reasonably assumed that they represent discrete territories – or, if there are two or more close together, locations where I’ve heard birds singing simultaneously. Then, later I go back to these places to try to relocate the birds, I then amend the map accordingly. I made over 30 visits to the patch between the middle of March and the end of May, mostly around dawn so as coincide with the peak song period. First arrival dates for the past 3 years. Number of singing males for the past 3 years. Where a species shows a strong preference for a certain habitat type, the density of singing males in that habitat. Extrapolated density of birds (not just singing males – so as to make a comparison with the BTO density figures) per km2, making the (rather bold) assumption that each singing male represents a pair, therefore 2 birds. The density of birds per km2 for my 10km square (SD50), as per the BTO 2013 Atlas. Blackcaps clearly find the wooded areas on the patch to their liking. The density of birds on the patch is much higher than the atlas figure for SD50. It is, though, comparable to the densities in squares which are predominantly wooded. There is an interesting clumping of birds in the western, higher altitude, part of the patch, despite there being a lot of similar habitat (scrub which borders woodland) elsewhere. SD50 density per km2 25-50 (per BTO Atlas 2013) (stable). 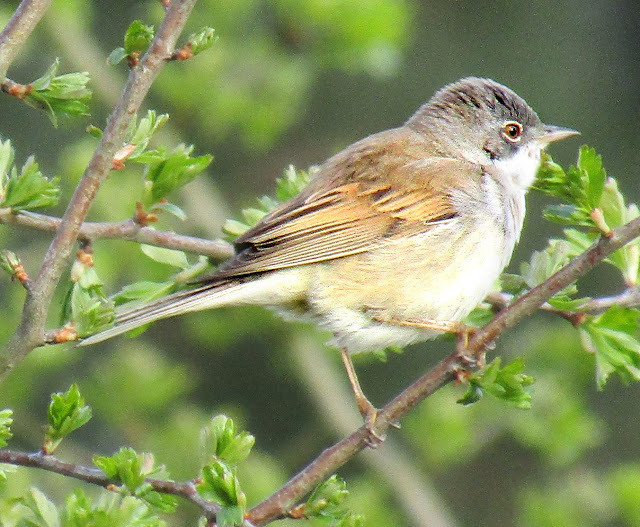 Whitethroats on the patch are closely tied to open scrub and the closed scrub which borders it. There is a lot of excellent Whitethroat habitat on the patch – derelict farmland, now scrub with very extensive bramble patches. The numbers are stable over the 3 year period. As the other 3 numerous species have shown increases, which, as discussed below is probably an artefact due to change in methodology, this may indicate a real decrease (this is a highly tentative conclusion however). This year the two males on the patch had very short song periods – even shorter than usual – I’m assuming that this is due to their finding mates very quickly rather than moving on. There is a lot of ideal habitat, with overgrown hedgerows, on the patch so it’s perhaps slightly surprising that there aren’t a few more birds. 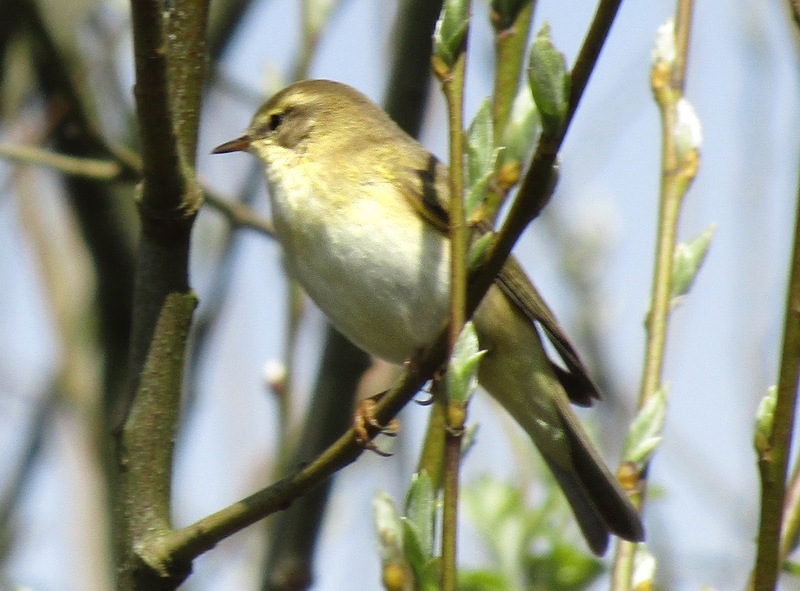 Like the Whitethroat, the Willow warbler finds a lot of habitat to its liking on the patch – derelict farmland, now open scrub with willow and birch. I am surprised, therefore, that my density figure appears to be at the low end of the BTO density range. Chiffchaffs on the patch are closely tied to the wooded area and the closed scrub that borders it. The places on the patch which hold Grasshopper warblers – open scrub – are at the ‘dry’ end of their spectrum of preferred habitats. This species is treated somewhat differently to the others. The map shows all the locations where I have heard reeling – at locations which are far enough apart for it to be reasonably assumed that they represent discrete territories – or, if there are two or more close together, locations where I’ve heard birds singing simultaneously. The locations in a clump, in the top left of the map, look suspiciously close together, however these were all birds heard singing simultaneously. I am less confident about the population estimate of this species than the others for reasons discussed below. Furthermore, this may well be subject to change as the breeding season progresses and new evidence, as to Grasshopper warbler presence or absence, comes to light. Seven is a conservative estimate of the population – there could well be several more. Sadly there were none this year. This is surprising given the, seemingly, prime pieces of Sedge warbler habitat on the patch. The lake, in particular, seems to be crying out for a Sedge warbler! This may be just a local anomaly, as BTO Bird Track for Northwest England isn’t showing any decline for the three year period, however this is within a more general UK picture of moderate decline. The map shows the strong preference for scrub and woodland and the avoidance of farmland, grassland and managed areas. When viewed this way a good impression is given of the sheer amount of avian biomass which arrives from the south in spring. If they weren't here, there would be a massive ecological vacuum of niches for small insectiverous birds of scrub and woodland. Furthermore this is just tiny snapshot of the whole country (and indeed the Western Palearctic) giving perhaps an idea of the number of birds that must be the on move during the course of a year. Accuracy. An important caveat regarding these results is that they represent the number of singing males, which clearly isn’t, necessarily, the same thing as the number of breeding pairs. Furthermore, factors which may result in a discrepancy between the two – such as the number of unmated males – may well vary between species. Though I can be confident that these results are reasonably accurate, they are highly unlikely to be totally accurate. Clearly there will be a margin for error, in the case of a numerous species such as the Willow warbler this could conceivably be as much as 10% (though I don’t think it’s that high). Due to the survey method I’ve employed and also my cautious approach I think these results are much more likely to represent minimum numbers than to be over-estimates. Despite the intensiveness of the monitoring effort, birds may still have been missed. The same bird may have been recorded more than once, i.e it may have moved. Whether or not a bird singing at a given location represents the same bird, as one I have already recorded at a nearby location, is a judgement on my part. That is to say I have to assess whether the two locations are near enough to represent the same bird, or far enough part to represent different ones. Song output varies widely between species – this will inevitably affect monitoring. For example, it would be easy to miss a Lesser whitethroat that happened to sing for just a few days, in a part of the patch I didn’t visit during that period. Comparison with previous years. One of my objectives in mapping warblers this spring was to attempt to verify the accuracy of the numbers I had recorded in previous years. My conclusion is that they are broadly accurate. I haven’t been over-estimating and have probably been under-estimating. The numerous species – Blackcap, Willow warbler and Chiffchaff (though not Common whitethroat), show an increase in numbers in each of the three years I have been monitoring them (for example, Willow warbler 35 in 2014, 39 in 2015, 46 in 2016). It is of course possible that this is due to a real increase over these years. I think, however, that this is much more likely to be due to a steady increase in monitoring ‘effort’ and a change in methodology. In 2014 and 2015 my population estimates were the results of multiple visits to different parts of the patch during the season during which I counted rather than mapped. They were therefore the sum of a number of ‘sub-counts’. In my eagerness not to count birds more than once I think, I probably ended up with under-estimates. For the less numerous species – Garden warbler, Lesser whitethroat and Sedge warbler, however, I can be more confident about a year-on-year comparison. For example, I can be pretty sure that the Sedge warbler has disappeared from the patch! Comparison with BTO density figures: my figures are mostly at the top end of the BTO’s density range for my 10 km square – or above them. This is the result I would expect. The patch is something of an island of good warbler habitat within a larger area of less favourable town and farmland. I have gone some way to verifying the accuracy of my counts of warbler populations. The patch holds large populations of several warbler species, which are important at a county level. patch - singing from within a dense bramble patch. This enigmatic and fascinating species is a special case. They can be difficult to detect and the detectability affects their monitoring to an unknown degree. I have found the following pattern over the last 3 years: I find birds singing in many locations, I am only able to relocate less than half of these. Equally birds seem to suddenly appear in new locations later in the season – June, July and August. This year, for example, I have found and mapped 21 locations where I’ve heard reeling (which is quite a lot more than previous years). I have only been able to relocate 7 of these (although my monitoring effort is still on-going). This kind of pattern isn’t one I notice with the other warblers (except Lesser whitethroat - somewhat). Some may be passage birds. Lancashire is probably on route to the current high-density hotspot in southwest Scotland. 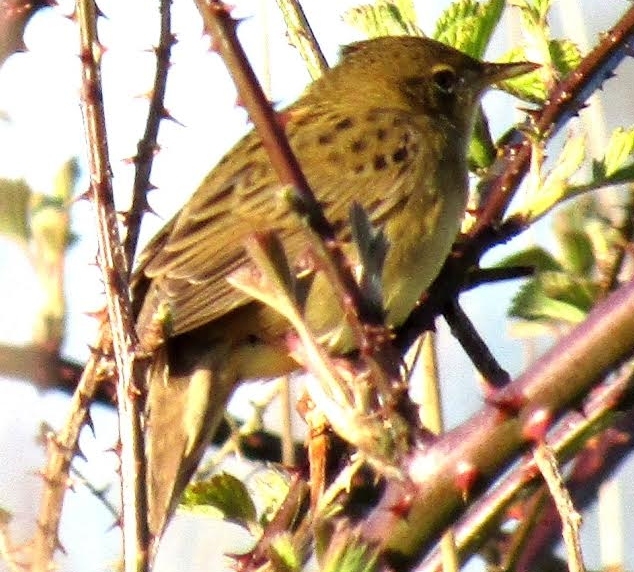 Grasshopper warblers sing very early in the morning – earlier than other warblers (and late in the evening and at night) – so can easily be missed. However, I am often up at first light, sometimes before. Song tails-off, once birds are mated, and further reduces as the season progresses. I get the impression that day time singing drops off even more rapidly than first light singing. Some song locations may represent the same bird which has moved. Grasshopper warbler territories shift as the season progresses in response to vegetation growth (which probably explains the sudden appearance of ‘new’ June, July, August birds). 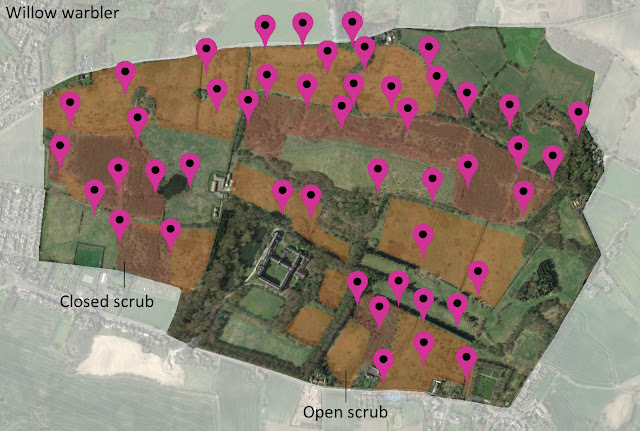 All 21 Grasshopper warbler locations are/were in suitable habitat - nearly all in extensive patches of brambles in open scrub. So none of the birds were singing from songposts of the kind which would immediately suggest that they were passage birds. 5 - birds which are continuing to sing consistently – perhaps unmated birds? 5 - 1 day singers – locations where I heard birds singing on just one occasion – perhaps passage birds? 11 – several day singers – locations where I have heard song over a period spanning several days (typically a week) – but which I haven’t been able to relocate. This last group are puzzling me – they have stayed around long enough for it to be, perhaps, assumed that they aren’t just on passage, but I haven’t been able to relocate them (although my monitoring effort is very much on-going). So the question is – if a lot of these birds are still here, where are they and why am I not detecting them? If most of these birds have gone, what were they doing – why were they singing for several days then going? Some of the birds I have down as one-day birds might actually fall into other groups - if they tried a songpost briefly before shifting elsewhere on the patch. There must be some adjustment in territories, and probably some displacement as males arrive in spring and the population builds. Birds may drop in and ‘try their luck’ (good candidates for being attracted in this way would be overflying birds returning for their first breeding season).